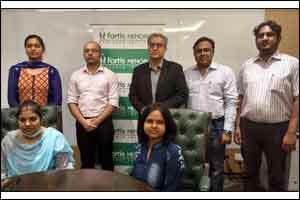 New Delhi: 50 cases that required intervention of ECMO (Extracorporeal membrane oxygenation) were conducted at Fortis Memorial Research Institute under the aegis of Dr Sandeep Dewan, Director and HOD, Critical Care and his team. ECMO is rapidly gaining recognition as a technique that is used to save people when all other options have been exhausted. There were two exceptional cases that illustrated how the timely use of ECMO could save a person’s life. The first patient, Ms. Vidushi, 31 years old diabetic who was diagnosed with pulmonary tuberculosis.The second patient,27-year-old Yashi, a patient who was shifted in a severe condition after contracting swine flu had suddenly gone into severe respiratory distress. Ms. Vidushi was a known case of type 2 diabetes mellitus and had been suffering from high-grade fever and a dry cough for over a month. She had been diagnosed with pulmonary tuberculosis (TB) and been on antitubercular treatment for over a month. On presentation, Vidushi was diagnosed with respiratory distress post which she was admitted in the ICU. Care was carried out as per protocol and she was put on the Bilevel Positive Airway Pressure system on which she maintained a saturation of 99%. Her condition deteriorated and she had to be put on ventilator support as her oxygen levels and blood pressure began to fall and she showed symptoms of severe acute respiratory distress syndrome. It was then that the patient was put on Veno-venous ECMO support. On the 6th day, the patient’s lung function started to improve, vasopressor (a drug or other agent which causes the constriction of blood vessels) support was gradually withdrawn and oxygen levels started improving. Vidushi was taken off ECMO after 8 days and discharged. In the second case, 27-year-old Yashi, a mother of a two-year-old was absolutely fine till August 5th when she suddenly developed high-grade fever and cough which worsened with each passing day. When Yashi was shifted to FMRI, her condition had rapidly deteriorated and she developed difficulty in breathing. She was diagnosed with Swine Flu. Her condition worsened and she was unable to maintain her saturations. So, she was put on a ventilator support. Chest X-ray was suggestive of a condition called “ARDS”. ARDS is a condition where lungs are unable to function properly and the patient is unable to maintain normal saturation. Every possible maneuver in ventilator was being tried, but unfortunately, the patient did not show any improvement. Finally, a decision to put the patient on ECMO support was decided. Since the patient was on very high ventilator requirements, it was impossible to shift the patient as she was and hence was moved to FMRI on portable ECMO. Yashi was on ECMO for three days after which she was shifted to a room and later discharged. Extra Corporeal Membrane Oxygenation: ECMO is a machine which acts as a heart-lung bypass. It can support and perform the functions of the lung and the heart, individually and together. The ECMO circuit acts as an artificial heart and lung for the patient during ECMO therapy. ECMO can be used in patients of all ages. ECMO continues until the underlying cardiac or lung problem is improved or resolved. The typical course is around five days, but in some cases, ECMO support can be continued for up to 25 to 30 days.